For other uses, see Maple (disambiguation). Acer /ˈeɪsər/ is a genus of trees and shrubs commonly known as maple. The genus is placed in the family Sapindaceae. There are approximately 128 species, most of which are native to Asia, with a number also appearing in Europe, northern Africa, and North America. Only one species, Acer laurinum, extends to the Southern Hemisphere. The type species of the genus is the sycamore maple, Acer pseudoplatanus, the most common maple species in Europe. The maples have easily recognizable palmate leaves and distinctive winged fruits. The closest relatives of the maples are the horse chestnuts. Most maples are trees growing to a height of 10–45 m (33–148 ft). Others are shrubs less than 10 meters tall with a number of small trunks originating at ground level. Most species are deciduous, and many are renowned for their autumn leaf colour, but a few in southern Asia and the Mediterranean region are evergreen. Most are shade-tolerant when young and are often riparian, understory, or pioneer species rather than climax overstory trees. There are a few exceptions such as sugar maple. Many of the root systems are typically dense and fibrous, inhibiting the growth of other vegetation underneath them. A few species, notably Acer cappadocicum, frequently produce root sprouts, which can develop into clonal colonies. Maples are distinguished by opposite leaf arrangement. The leaves in most species are palmate veined and lobed, with 3 to 9 (rarely to 13) veins each leading to a lobe, one of which is central or apical. A small number of species differ in having palmate compound, pinnate compound, pinnate veined or unlobed leaves. Several species, including Acer griseum (paperbark maple), Acer mandshuricum (Manchurian maple), Acer maximowiczianum (Nikko maple) and Acer triflorum (three-flowered maple), have trifoliate leaves. 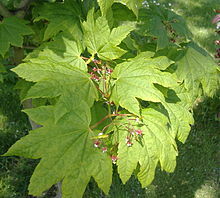 One species, Acer negundo (box-elder), has pinnately compound leaves that may be simply trifoliate or may have five, seven, or rarely nine leaflets. 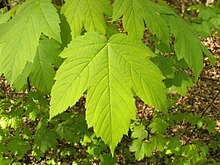 A few, such as Acer laevigatum (Nepal maple) and Acer carpinifolium (hornbeam maple), have pinnately veined simple leaves. Maple species, such as Acer rubrum, may be monoecious, dioecious or polygamodioecious. The flowers are regular, pentamerous, and borne in racemes, corymbs, or umbels. They have four or five sepals, four or five petals about 1 – 6 mm long (absent in some species), four to ten stamens about 6 – 10 mm long, and two pistils or a pistil with two styles. The ovary is superior and has two carpels, whose wings elongate the flowers, making it easy to tell which flowers are female. Maples flower in late winter or early spring, in most species with or just after the appearance of the leaves, but in some before the trees leaf out. 3D rendering of a µCT scan of a samara. Resolution is about 45 µm/voxel. The distinctive fruits are called samaras, "maple keys", "helicopters", "whirlybirds" or "polynoses". These seeds occur in distinctive pairs each containing one seed enclosed in a "nutlet" attached to a flattened wing of fibrous, papery tissue. They are shaped to spin as they fall and to carry the seeds a considerable distance on the wind. People often call them "helicopters" due to the way that they spin as they fall. During World War II, the US Army developed a special air drop supply carrier that could carry up to 65 pounds (29 kg) of supplies and was based on the Maple seed. Seed maturation is usually in a few weeks to six months after flowering, with seed dispersal shortly after maturity. However, one tree can release hundreds of thousands of seeds at a time. Depending on the species, the seeds can be small and green to orange and big with thicker seed pods. The green seeds are released in pairs, sometimes with the stems still connected. The yellow seeds are released individually and almost always without the stems. Most species require stratification in order to germinate, and some seeds can remain dormant in the soil for several years before germinating. The genus Acer together with genus Dipteronia are either classified in a family of their own, the Aceraceae, or else classified as members of the family Sapindaceae. Recent classifications, including the Angiosperm Phylogeny Group system, favour inclusion in Sapindaceae. When put in family Sapindaceae, genus Acer is put in subfamily Hippocastanoideae. Fifty-four species of maples meet the International Union for Conservation of Nature criteria for being under threat of extinction in their native habitat. The leaves are used as a food plant for the larvae of a number of the Lepidoptera order. (see List of Lepidoptera that feed on maples). In high concentrations, caterpillars, like the greenstriped mapleworm (Dryocampa rubicunda), can feed on the leaves so much that they cause temporary defoliation of host maple trees. Aphids are also very common sap-feeders on maples. In horticultural applications a dimethoate spray will solve this. In the United States and Canada, all maple species are threatened by the Asian long-horned beetle (Anoplophora glabripennis). Infestations have resulted in the destruction of thousands of maples and other tree species in Illinois, Massachusetts, New Jersey and New York. Maples are affected by a number of fungal diseases. Several are susceptible to Verticillium wilt caused by Verticillium species, which can cause significant local mortality. Sooty bark disease, caused by Cryptostroma species, can kill trees that are under stress due to drought. Death of maples can rarely be caused by Phytophthora root rot and Ganoderma root decay. Maple leaves in late summer and autumn are commonly disfigured by "tar spot" caused by Rhytisma species and mildew caused by Uncinula species, though these diseases do not usually have an adverse effect on the trees' long-term health. A maple leaf is on the coat of arms of Canada, and is on the Canadian flag. The maple is a common symbol of strength and endurance and has been chosen as the national tree of Canada. Maple leaves are traditionally an important part of Canadian Forces military regalia, for example the military rank insignia for generals use maple leaf symbols. There are 10 species naturally growing in the country, with at least one in each province. Although the idea of the tree as a national symbol originally hailed from the province of Quebec where the sugar maple is significant, today's arboreal emblem of Canada rather refers to a generic maple. The design on the flag is an eleven-point stylization modeled after a sugar maple leaf (which normally bears 23 points). It is also in the name of Canadian ice hockey club Toronto Maple Leafs. The first attested use of the word was in 1260 as "Mapole", and it also appears a century later in Geoffrey Chaucer's Canterbury Tales, spelled as "mapul". The maple is also a symbol of Hiroshima, ubiquitous in the local meibutsu. 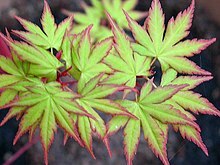 Acer palmatum (Japanese maple) has over 1,000 cultivars. 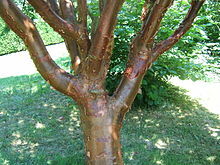 This cultivar is A. palmatum 'Sango kaku', sometimes called "coralbark maple"
Some species of maple are extensively planted as ornamental trees by homeowners, businesses and municipalities due to their fall colour, relatively fast growth, ease of transplanting, and lack of hard seeds that would pose a problem for mowing lawns. Particularly popular are Norway maple (although it is considered invasive in North America), silver maple, Japanese maple, and red maple. Other maples, especially smaller or more unusual species, are popular as specimen trees. Numerous maple cultivars that have been selected for particular characteristics can be propagated only by asexual reproduction such as cuttings, tissue culture, budding or grafting. Acer palmatum (Japanese maple) alone has over 1,000 cultivars, most selected in Japan, and many of them no longer propagated or not in cultivation in the Western world. Some delicate cultivars are usually grown in pots and rarely reach heights of more than 50–100 cm. Maples are a popular choice for the art of bonsai. Japanese maple (Acer palmatum), trident maple (A. buergerianum), Amur maple (A. ginnala), field maple (A. campestre) and Montpellier maple (A. monspessulanum) are popular choices and respond well to techniques that encourage leaf reduction and ramification, but most species can be used. Maple collections, sometimes called aceretums, occupy space in many gardens and arboreta around the world including the "five great W's" in England: Wakehurst Place Garden, Westonbirt Arboretum, Windsor Great Park, Winkworth Arboretum and Wisley Garden. In the United States, the aceretum at the Harvard-owned Arnold Arboretum in Boston is especially notable. In the number of species and cultivars, the Esveld Aceretum in Boskoop, Netherlands is the largest in the world. Maples are important as source of syrup and wood. Dried wood is often used for the smoking of food. Charcoal from maples is an integral part of the Lincoln County Process used to make Tennessee whiskey. They are also cultivated as ornamental plants and have benefits for tourism and agriculture. The sugar maple (A. saccharum) is tapped for sap, which is then boiled to produce maple syrup or made into maple sugar or maple taffy. It takes about 40 litres (42 US qt) of sugar maple sap to make 1 litre (1.1 US qt) of syrup. While any Acer species may be tapped for syrup, many do not have sufficient quantities of sugar to be commercially useful. The maple syrup industry is concentrated in Quebec, Canada and worth about half a billion Canadian dollars annually. Some of the larger maple species have valuable timber, particularly Sugar maple in North America, and Sycamore maple in Europe. Sugar maple wood—often known as "hard maple"—is the wood of choice for bowling pins, bowling alley lanes, pool cue shafts, and butcher's blocks. Maple wood is also used for the manufacture of wooden baseball bats, though less often than ash or hickory due to the tendency of maple bats to shatter if they do break. The maple bat was introduced to Major League Baseball (MLB) in 1998 by Sam Bat founder Sam Holman. Today it is the standard maple bat most in use by professional baseball. Maple is also commonly used in archery as the core material in the limbs of a recurve bow due to its stiffness and strength. Maple wood is often graded based on physical and aesthetic characteristics. The most common terminology includes the grading scale from common #2; which is unselected and often used for craft woods; common #1, used for commercial and residential buildings; clear; and select grade, which is sought for fine woodworking. These select decorative wood pieces also have subcategories that further filter the aesthetic looks. Crotch Wood, Bees Wing, Cats Paw, Old Growth and Mottled are some terms used to describe the look of these decorative woods. Maples have a long history of use for furniture production in the United States. Maple is considered a tonewood, or a wood that carries sound waves well, and is used in numerous musical instruments. Maple is harder and has a brighter sound than mahogany, which is another major tonewood used in instrument manufacture. The back, sides, and neck of most violins, violas, cellos, and double basses are made from maple. Electric guitar necks are commonly made from maple, having good dimensional stability. The necks of the Fender Stratocaster and Telecaster were originally an entirely maple one piece neck, but later were also available with rosewood fingerboards. Les Paul desired an all maple guitar, but due to the weight of maple, only the tops of Gibson's Les Paul guitars are made from carved maple, often using quilted or flamed maple tops. Due to its weight, very few solid body guitars are made entirely from maple, but many guitars have maple necks, tops or veneers. Maple is also often used to make bassoons and sometimes for other woodwind instruments like maple recorders. Many drums are made from maple. From the 70s to the 90s, maple drum kits were a vast majority of all drum kits made, but in recent years, birch has become popular for drums once again. Some of the best drum-building companies use maple extensively throughout their mid-pro range. Maple drums are favored for their bright resonant sound. Certain types of drum sticks are also made from maple. As they are a major source of pollen in early spring before many other plants have flowered, maples are important to the survival of honeybees that play a commercially important role later in the spring and summer. Maple is used as pulpwood. The fibers have relatively thick walls that prevent collapsing upon drying. This gives good bulk and opacity in paper. Maple also gives paper good printing properties. Many maples have bright autumn foliage, and many countries have leaf-watching traditions. The sugar maple (Acer saccharum) is the primary contributor to fall "foliage season" in North America, particularly in Central Ontario, Québec, and northern New England, New York, Wisconsin, and Michigan. In Japan, the custom of viewing the changing colour of maples in the autumn is called momijigari. Nikko and Kyoto are particularly favoured destinations for this activity. In Korea, the same viewing activity is called danpung-nori and the Seoraksan and Naejang-san mountains are among the best-known destinations. ^ Xu, Tingzhi; Chen, Yousheng; de Jong, Piet C.; Oterdoom, Herman John; Chang, Chin-Sung. "Acer". Flora of China. 11. Retrieved 27 May 2012 – via eFloras.org, Missouri Botanical Garden, St. Louis, MO & Harvard University Herbaria, Cambridge, MA. ^ "Sky Hook Spirals from Plane" Popular Mechanics, December 1944, p. 75. ^ "Classification of Genus Acer". Web.archive.org. 12 August 2007. Archived from the original on 12 August 2007. Retrieved 19 November 2017. ^ "Fact Sheets". Umassgreeninfo.org. Retrieved 19 November 2017. ^ Phillips, D. H. & Burdekin, D. A. (1992). Diseases of Forest and Ornamental Trees. Macmillan. ISBN 0-333-49493-8. ^ Fraser, Alistair B. (1998). "National Symbols". The Flag of Canada. Retrieved 19 November 2017. ^ Heritage, Canadian. "Official symbols of Canada - Canada.ca". Canada.pch.gc.ca. Retrieved 19 November 2017. ^ Sandberg, L. Anders (2014). Urban Forests, Trees, and Greenspace: A Political Ecology Perspective. Routledge. ^ "maple, n.1". Oxford University Press. Retrieved 19 November 2017 – via Oxford English Dictionary. ^ D'Cruz, Mark. "Ma-Ke Bonsai Care Guide for Acer buergerianum". Ma-Ke Bonsai. Retrieved 2011-07-05. ^ Zandona, Eric. "Tennessee Whiskey Gets a Legal Definition". EZdrinking. Retrieved 2014-01-11. ^ Marowits, Ross (20 February 2017). "Quebec increases maple syrup production amid internal revolt, foreign competition". CBC. Archived from the original on 18 May 2017. Retrieved 21 May 2017. ^ "Publications" (PDF). Ahec.org. Retrieved 19 November 2017. ^ Joseph Aronson (1965). The encyclopedia of furniture. Random House, Inc. pp. 300–. ISBN 978-0-517-03735-5. Retrieved 8 September 2010. ^ Geoff Nicholls; Tony Bacon (1 June 1997). The drum book. Hal Leonard Corporation. pp. 54–. ISBN 978-0-87930-476-8. Retrieved 19 October 2010. Philips, Roger (1979). Trees of North America and Europe. New York: Random House, Inc. ISBN 0-394-50259-0. Wikimedia Commons has media related to Acer.